We discussed some of the most critical tasks and activities concerning spring lawn care on previous occasions, offering you plenty of tips and advice. However, we know that lawn care is a costly expense for a family and a relatively controversial one – when it comes to water consumption or the use of fertilizers and pesticides. To make things clearer, today we will present you with some advice, tips, and suggestions provided by our experts in lawn care in Lake Ridge VA so that you can maintain a lush lawn and landscape without wasting too much money. Professional Irrigation Systems: Did you know that homeowners consume staggering amounts of water when they irrigate their lawns throughout the year? Besides local regulations on water waste and a general concern about environmental issues, water waste leaves some burns in your pocket as well. It may sound wrong to install an irrigation system in this framework, but a smart one will save you money yearly. First of all, smart sensors and hi-tech sprinklers save water by irrigating the lawn at the right times and the right amounts of water. Talk to our experts in lawn care in Lake Ridge VA about irrigation system installations to learn more about how a new-generation system can keep your lawn pristine without rampaging through your budget. Organic Fertilization: In this category, we have mulch and compost. When it comes to lawn fertilization and weed control, you need an expert team to deal with problematic issues and apply custom fertilizers and herbicides. Beyond that, however, mulch and compost nourish the soil slowly, limiting the use of chemical products in your yard and garden. Moreover, mulch keeps the ground moist and fresh in summer (and warm in winter), acting as a defense mechanism against weeds, pests, and diseases. A nice layer of mulch also helps with the preservation of a pristine look of your property all year long. 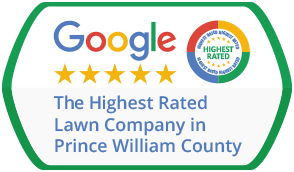 Expert Services From Pros In Lawn Care in Lake Ridge VA: A team of pros assesses your lawn and garden, making sure the property receives precisely the care and maintenance it needs, nothing more and nothing less. Experts do not make mistakes and do not overdo things. There is no risk or extra costs in working with a professional lawn care company, as it preserves your budget within limits by offering integrated lawn care services. Learn more about money saving and benefitting from expert services from our pros in lawn care in Lake Ridge VA! We are more than glad to provide you with a free estimate and personalized interventions to maintain a lush and healthy lawn with no hidden fees, but with safe interventions!